The Top 15 Most Endangered Sharks In 2017 - We Love Sharks! The Top 15 Most Endangered Sharks In 2017 - We Love Sharks! It is estimated that every year about 100 million sharks are killed by people for various reasons. This figure includes many of the most endangered sharks on the planet. As more and more people turn to the oceans for various recreational and commercial reasons, human-to-shark encounters will continue. Most times such interaction is to the detriment of the shark. The changing environment also means that many of these precious animals are endangered and in danger of extinction in the near future. The International Union for Conservation of Nature (IUCN) is the world’s largest and oldest global environmental network. It is tasked with gathering information on biodiversity and managing hundreds of conservation projects in over 160 countries. The IUCN regularly monitors and publishes the latest data on shark conservation status under different categories. In this post, we’ll be looking at three of the threatened categories: vulnerable species, endangered species and critically endangered. Status: Critically Endangered, Possibly Extinct. The Pondicherry Shark is critically endangered and may well be already extinct. It has not been sighted since 1979 though it used to be abundant in the Indo-Pacific Region. This shark has a gray body, white underbelly and black-tipped pectoral, second dorsal and caudal fins. Its population was decimated by heavy, unregulated fishing in the region. Finding any existing Pondicherry shark is now a priority for the IUCN. The Striped Smooth-Hound is a type of houndshark that swims off the coast of Brazil and northern Argentina. Unfortunately for this species, their nursing grounds are in a popular fishing area. Within a six year period from 1994 to 1999, this species declined by as much as 96 percent because the mothers and pups were continuously caught as bycatch. There are no specific conservation efforts for this shark to date. This shark lives in tidal rivers and coastal waters in Papua New Guinea and northern Australia. They have a stocky gray body, high back, tiny eyes, and broad fins. Grown adults measure up to 2.5 meters (8.2 feet). Currently, the Northern River Shark is rarely sighted and has suffered much from habitat degradation, and recreational/commercial overfishing. Due to this overfishing coupled with its extremely low birth rate (9 pups every 2 years), it is now assessed as critically endangered. The Daggernose Shark is near extinction. It’s a small shark measuring about 1.5 meters (4.9 feet) at maturity. Its habitat is the tropical waters off the coasts of Brazil and Trinidad. This shark has a long and pointed snout, and large-paddle shaped pectoral fins. The IUCN estimates that over the last decade, this shark has had up to 90 percent decline in population due to commercial fishing for its meat and as bycatch. The Smoothback Angel Shark thrived in large numbers over large areas along the coast and continental shelf of the Mediterranean Sea and the Northeast Atlantic. That is no longer the case due to intense demersal fishing (fishing along the sea/ocean bottom). Over a 50 year period, it has been completely eliminated from many of its natural habitats especially in the Mediterranean Sea. Therefore, it is now one of the most endangered sharks in the wild. This shark has a characteristically smooth back and resembles a ray. 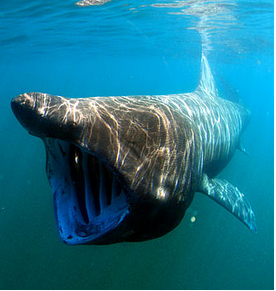 Though the basking shark is now officially protected in many countries, people still hunt it relentlessly for its fins. Basking shark fins are amongst the most valuable of shark fins in China and Japan. This large, slow-moving fish is a filter feeder that can grow up to 12 meters (40 feet) in length and it is the second-largest fish in the world after the whale shark. Basking sharks have become scarce in many areas, like the North Pacific and they face a high risk of extinction the medium-term. This shark dwells in the Ganges River in India. It’s a true river shark that lives in freshwater and does not need saltwater to survive. This species is often confused with the bull shark because of its appearance. It has a stocky build, blunt snout and grows to a maximum length of 6.8 feet (2 meters). Because of overfishing (for its jaws and fins), and destruction of its habitat from pollution, building of dams, and barrages, the Ganges shark has been depleted to the point where the Indian Government has completely banned people from fishing it. The Porbeagle Shark is a mackerel shark that is highly prized by commercial fisheries and sports fishermen. This is a pelagic shark, and it is among the world’s fastest sharks. Its meat is popular, and that led to unregulated overfishing that caused near extinction of this species. Though the Porbeagle is classified as vulnerable globally, it’s critically endangered in the North Atlantic. Fortunately, there was timely intervention and a lot of conservation efforts for the survival of the Porbeagle thereby ensuring the preservation of the species. However, their numbers have not recovered in the North Atlantic. This beautiful and unique looking fish is popular for its meat, fins, and liver oil. 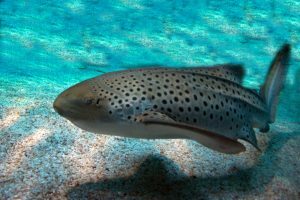 Also, as a bottom-feeding species that inhabits the shallow waters along coral reefs, the zebra shark is vulnerable to overfishing. The zebra sharks grows to 2.5 meters (8.2 feet), and it has a beautiful pattern of black dots on its pale skin. They are nocturnal. This is another rarely seen shark that dwells in the inshore waters around Mukah, northwestern Borneo. It’s small, gray in color and grows to 26 inches (65 cm). Though it has limited commercial value, it’s frequently caught as bycatch. It was not seen for many years between 1937 and 2004 and to date, few scattered specimen are discovered from time to time in the waters around Mukah and nowhere else. As a result of its scarcity, the Borneo shark is another species that is of major concern to the IUCN. This deepwater dogfish is another rarely seen endangered shark species. It is known to dwell only along the east coast of Australia and a few scattered spots to the north and west of New Zealand. The Harrison’s dogfish has a slender gray to gray/brown colored body, a long robust head, large mouth and large green eyes. It grows up to a length of 1.1 meters (43 inches). Dumb Gulper sharks are a target of commercial fisheries for their liver oil and meat. Combined with the fact that it has one of the lowest reproductive rates among sharks; one or two pups every one or two years, its population is estimated to have dropped by as much as 99 percent since the 1970s. As a result of this, there are measures in place to protect it. For a start, it has been incorporated into the Environmental Protection and Biodiversity Conservation (EPBC) Act with a view to keeping this species safe. The Natal Shyshark is a shark species that is endemic to a small area along the coast of South Africa. It’s a small shark that grows to about 20 inches (50 cm) in length at maturity and is easily identified by a distinctive H-shaped pattern on its skin. They are called shyshark because they curl into a ring and cover their eyes with their tails when they feel threatened. Because of rapid industrial and tourist development around Durban, South Africa the Natal Shyshark’s habitat is under continuous threat and degradation. Also, it is frequently caught as bycatch by prawn fisheries in the area. Argentine Angelsharks are purplish-brown, bottom-dwelling Atlantic fish found in the Southwest Atlantic to southern Brazil, through Uruguay to northern Patagonia, Argentina. They are a highly vulnerable to trawl and gillnet fishing and reproduce only once every two years. Therefore, this species is highly susceptible to population decline. Angel sharks are also fished heavily in southern Brazil. For instance, documented figures over the years show that about 2000 tons of angel shark were caught every year from 1986 to 1989. Since 1992, there has been a Maximum Permitted Catch (MPC) limit for angel sharks, but enforcement is difficult. The Smoothtooth Blacktip Shark is robust, has large nostrils, small eyes with nictitating membranes, and black-tipped fins. The largest specimen measured 1.2 meters (3.9 feet) long. They live in small concentrations around Yemen and Kuwait. 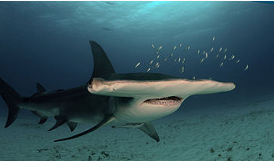 The great hammerhead is the largest of the hammerhead species. It grows to a maximum length of 6.1 meters (20 feet) and dwells in coastal areas and the continental shelf of tropical and warm temperate waters worldwide. It’s a direct target of commercial finning in Asia and is highly sought after for its large fins. In addition, fisheries catch it for its liver oil (for vitamins), its skin (for leather), and use its carcass for fishmeal. The IUCN moved to list it as an endangered species, facing the extremely high risk of extinction in the near future. Figures show its population has decreased by about 80 percent. Endangered Sharks And The Human Factor. It is alarming to note that in every instance of depleted shark population, human activity is a recurring and directly responsible factor. In fact, it appears anywhere there is interaction between sharks and commercial/industrial human activity sharks will die in their thousands. We continue to put pressure on sharks by killing them across different generations as adults, pregnant females and pups are not spared. But should this be the case? Certainly not! Today’s highly efficient fishing techniques tremendously increase incidents of shark bycatch. Fisheries are venturing deeper into the oceans and seas than ever before. The massive demand for sharks and shark products has resulted in the overexploitation of different shark populations. As sharks become scarce, there is an increase in shark fin prices and fishing effort. Very few countries are bothering to implement sustainable shark fishing policies and regulations. Hence, overfishing continues in many regions. A lot of people still hate and fear sharks, and that’s even an understatement. What Can You Do To Help Sharks? You’ll notice that the above sharks are just some of the many species that are currently under threat of extinction in the middle-to-near future. The IUCN Red List has 20 sharks on its endangered list. Worldwide, shark populations have fallen by as much as 90 percent. For example, blacktip sharks have declined by 93 percent, tiger sharks 97 percent, bull sharks and dusky sharks by 97 percent. Support conservation efforts by the IUCN and other authorities to preserve endangered sharks. Report any incident of shark abuse you observe. Don’t buy authentic shark products (real jaws, teeth, fins, etc.) unless the items are fossils. Donate to shark conservation efforts. Share information and posts like this one on social media to create awareness. You’ll be surprised to know that many people are just not aware about the plight of sharks. In conclusion, 11 of the species that the IUCN has data for are critically endangered sharks and some of the data for other species is not even complete yet. Therefore at least 11 shark species are likely swimming into extinction shortly. Think about it.